Our Practice Paper app is available now on iPhones and iPads, for $0.99 (US), on the App Store. This app allows you to print blank paper for your students to use during your lessons. We recommend that you use the gray version. Choose the line widths according to each student’s level — use wider spacing for students who need more support. As the student becomes more adept, use the narrower paper. Students should learn and practice with this paper, and transition to notebook and filler paper. Your students will learn to fill in their name and the date; until they do you can have the app print the name and date cues. We recommend that you use cursive, but if you prefer to have those cues in print, make that selection at the “cursive” switch. To buy this app, visit the app store. Click on the image above to see a copy (with my name, and penmanship) of a student’s writing during a tutoring session. The first two lines are for the “one minute drill”, which gives the student practice writing automatically. Sound and word dictation follows, and finally a practice sentence. 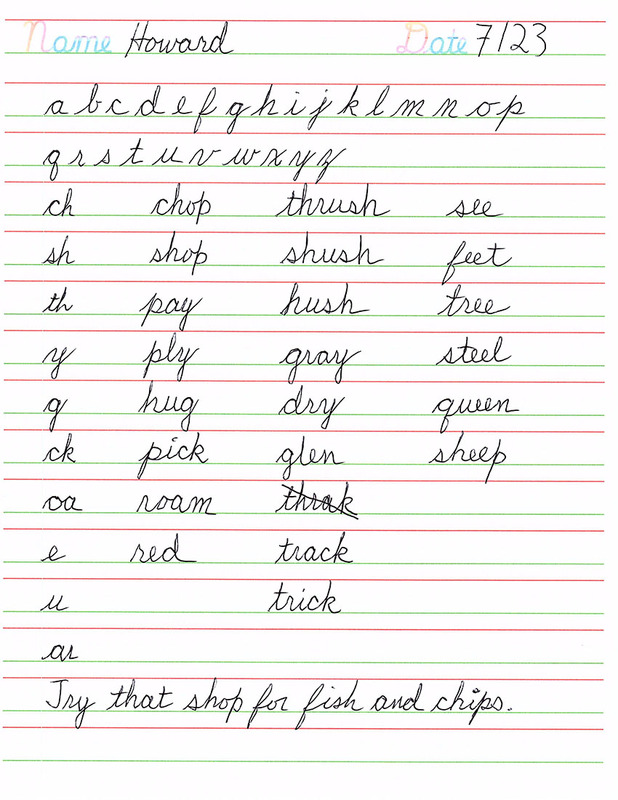 This writing practice focused on the h-brothers – ch, sh, and th.